so we need to see your crafty makes using Black and Purple as your main colours. 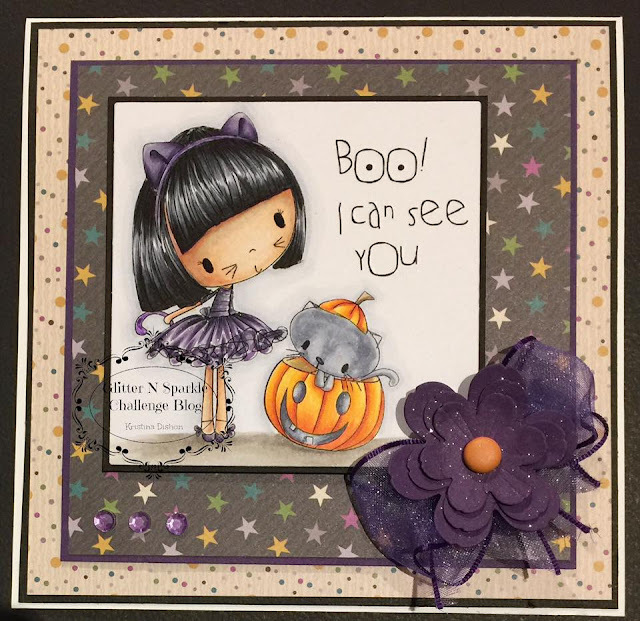 This theme is great for all your Halloween inspired cards! We have some wonderful sponsors this week who are offering great prizes, so really there is no reason not to play along!! Our first sponsor is All Dressed Up - who is offering 2 images from their store. Our third sponsor is Kitty Bee Designs - who is offering 1 image from their store. Oh my goodness, she has cute little kitty whiskers! You did a great job coloring this image and that blackish/purple sparkly ribbon is a wonderful accent. Such a sweet card and coloured beautifully!! Love the purple and black together! Thanks for joining our challenge this week with Kraftin Kimmie Stamps!